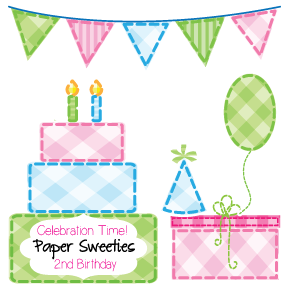 It's Paper Sweeties' 2nd Birthday, and the party horns are sounding! I was tickled pink when my friend, Debbie Marcinkiewicz, asked if I'd help her celebrate this special occasion. Happy birthday, Debbie! 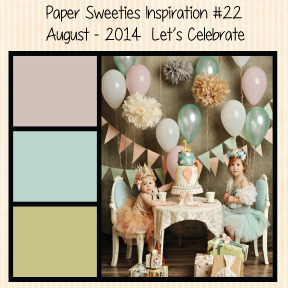 I used the Paper Sweeties August inspiration photo and colors for my card. I used the adorable little set, Pennant Party. Love the flexibility of the sentiments and banner. I stamped the banner on pale blue striped paper, and added some embellishments to it: Liquid Pearls, vintage thread bows, tiny punched flowers with more Liquid Pearls. I assembled the sentiment alongside the neat-o cake stand, which is part of the design on the patterned paper. Thanks so much for taking a peek today! Your next stop on the blog hop is Lysa Rohrer's blog. Have fun hoppin'! GORGEOUS! But especially LOVE the liquid pearls on your banners! Ohh Wow ! This is so Beautiful !! So pretty! I love the banner!!! This is gorgeous! I loveeeeeee the banner!!! Super card, Colleen! I love that cake stand and the pretty banners. Gorgeous paper, too. 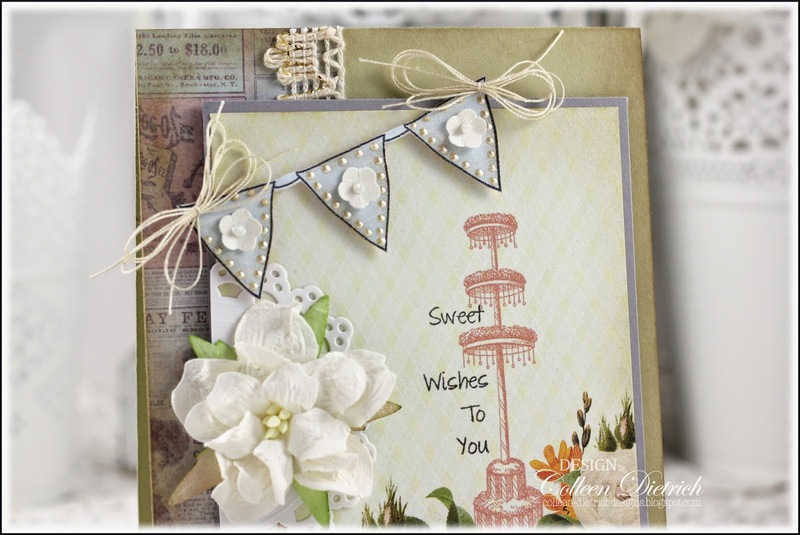 This card is just dripping with shabby chic charm! 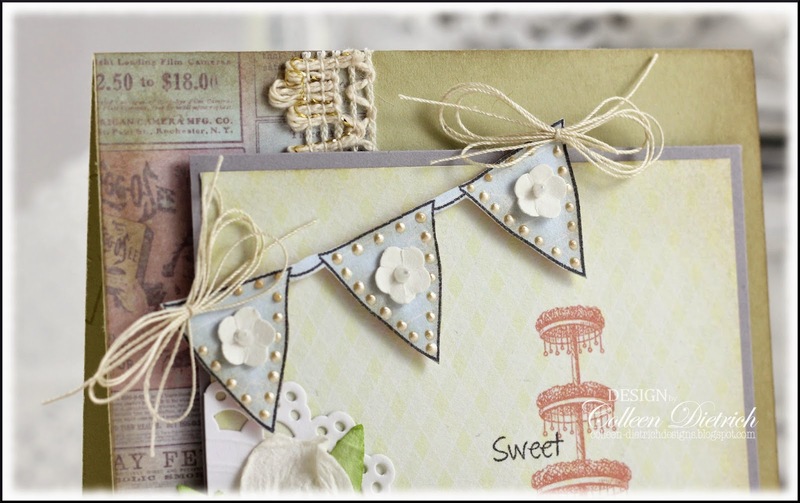 Adore the soft palette and fun pennants! Thanks for joining us for the birthday hop! Such a shabby chic beauty! Just so gorgeous, Colleen! A shabby chic beauty indeed! Love the banner with tiny flowers and liquid pearls! Loved seeing that you were in the hop with us!! This is beeeeeautiful Colleen. I especially love the liquid pearls on the banner!! Colleen, you have a new fan! 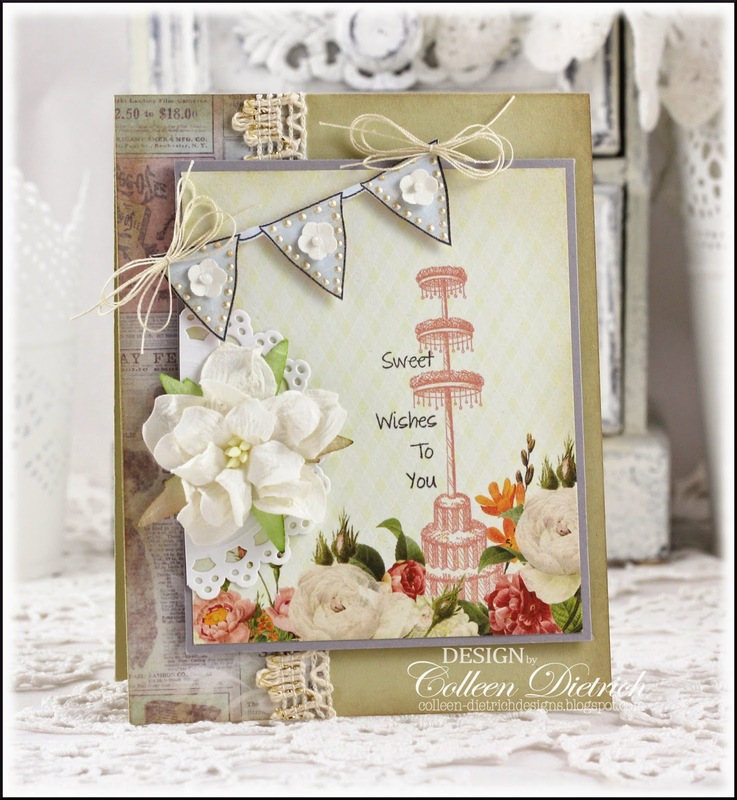 Love how you layer and compose a beautiful card! That banner WILL be CAS'd! Wow Colleen, so delicate and beautiful! Oh my. So So cute Colleen!! I love the sweet banner!!!! That party scene is so cute and you captured it all in your fun tag. Love the dots on the banner - great idea. Hugz!!! This is awesome paper! I love how you interpreted the challenge! Wow! This is such a gorgeous card! Love every detail on it. Oh, how beautiful, Colleen! Fabulous banner, and again with the Liquid Pearls, sigh... Love how you arranged the sentiment. Just gorgeous all over! I wrote it before and I have to write it again; you never cease to amaze me. Colleen this card is a beautiful reflection of your elegant style. I love love love the banner with pearls. It really is a jaw dropper; stunning! Oh my, elegance plus, and the let's celebrate too! Those flower banners are wonderful! !